Hosts Australia, New Zealand and Russia went unbeaten on day one of the HSBC World Rugby Women's Sevens Series but England caused a shock as they failed to the qualify for the Cup quarter-finals for the first time in the history of the competition. England lost to both Russia and USA at the Allianz Stadium in Pool C on Friday, meaning they will compete for the Challenge Trophy on Saturday in Sydney. Ireland and Fiji both emerged from Pool B along with Australia as they impressed, while France did just enough to join New Zealand and Canada from Pool A. The Cup quarters will see New Zealand play France, Ireland take on USA, Australia face Fiji and Russia meet Canada in what's sure to be a close encounter in the Sydney sun. Invitational side Papua New Guinea made New Zealand work hard for their win, but the class of the Black Ferns Sevens shone through, with tries from Portia Woodman, and three from speedster Michaela Blyde: “My job is just to put the ball down, the girls do all the hard work. This is sevens series competition and it’s going to be hard every game, so it’s good to blow out cobwebs in that game but we need to step it up." The game ended with a fantastic try from PNG, after a beautiful pass in midfield setting up Joanne Lagona, much to the delight of the Australian fans. However, despite a strong start in the second game of the day helped by another Lagona try, Papua New Guinea were no match for the Canadians, who won that encounter, 39-5. The New Zealand v France clash had fans on the edge of their seats in Sydney as France went toe-to-toe with the series leaders. Kelly Brazier scored first before Clemence Gueucier dotted down for France. Chloe Pelle then finished after relentless work by the French before Kelly Brazier broke through the French defence to make it 14-12. A late rally by France wasn’t enough and it finished with New Zealand winning by two. France ensured their quarter-final place with a 31-10 win over Papua New Guinea and the same scoreline separated New Zealand and Canada in the last match of the day, with brilliant tries from Portia Woodman and Blyde on display as they cemented top spot in the pool. Ireland had been training in Australia for a week before the Sydney tournament, and their conditioning clearly helped them to a win over Fijiana in the first Pool B match of the day. Amee Leigh Murphy Crowe scored two and Ashleigh Baxter also touched down as they took the spoils, 19-12. Australia ran out to huge applause on Friday afternoon as they faced Brazil in their first match on home soil since the Olympic Games last year. Despite the 24-7 scoreline, Brazil brought the game to the Australians and showed a marked improvement since their last appearance in Dubai. The clash of Fiji and Brazil resulted in some top tries from as Fiji ran out 31-10 winners before Ireland and Australia clashed. Led by captain Lucy Mulhall, the Irish tackled strongly, but despite their efforts, two tries from Emilee Cherry along with scores from Ellia Green, Evania Pelite and Georgina Friedricks saw the Olympic champions claim a 29-0 victory. Ireland later secured their place in the quarter-finals with a 33-5 victory over Brazil; a hat-trick from Amee Leigh Murphy Crowe as well as tries from Mulhall and Megan Williams sealed the win. Ireland face USA on Saturday for their first quarter-final appearance since 2013. Despite a slow start to the day, Fiji grew in confidence as the day wore on and will be pleased with their performance against the hosts on Friday evening. Some intricate passing saw Timaima Ravisa, Pricilla Siata and Lavenia Tinai cross the line for Fiji but tries from Cherry and Chloe Dalton kept Australia in the game. The match was won after Fiji had a player sent to the bin and Australia expolited the space to release Tiana Penitani, who delivered a beatiful offload to Pelite to go under the posts. The match finished with Green sealing the win with a try in the corner. Fijiana will have another go at the Olympic and Series champions when they meet in the quarter-finals on day two. Jo Watmore got back into the swing of things as England opened the day’s action against Spain, as the winger scored a hat trick at the Allianz Stadium to win, 19-10. Russia, who took the bronze in Dubai last time out, opened their day with a well-earned win against USA with two tries from Alena Mikhaltsova and one from Elena Zdrokova, edging out the two from Naya Tapper as Russia won 19-10. 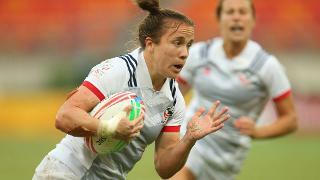 A sublime effort from Heather Fisher wasn’t enough as England lost to a strong USA side, 22-14. Alev Kelter, one of the impressive performers on day one, scored two tries with Kristen Thomas and Nicole Heavirland also getting on the scoreboard. Meanwhile, a hat-trick from Mikhaltsova helped Russia to a 24-5 win over the Spainsh. The clash of England and Russia showed the lengths the Russians have come since they failed to qualify for the Olympics last year. Five tries, including two from Zdrokova, saw them completely outplay their opponents as they progressed to the quarter-finals. France's win over Papua New Guinea meant that they missed out on the quarter-finals for the first time since the series began in 2012. The action resumes on Saturday when New Zealand play France at the Kippax Field at 10am (GMT +11) Click here to find out where you can watch the action from Sydney.